Teacups and Teapots Are Everywhere! Tea ware is fully embedded into our culture. After all, we immediately recognize a teacup, even when encountered very unexpectedly! But in 17th-century Europe? Not So Much. When the Dutch brought tea to Europe in the beginning of the 1600s, people knew they wanted it. After all, it was costly and rare and new. But it was also met with some bafflement. What, exactly, do you do with the stuff? So, as my previous post pointed out, the arrival of tea triggered a slew of new needs—including suitable teapots. Which didn’t yet exist in Europe. In looking into this, I quite inadvertently initiated a chain reaction of my own! When I downloaded a research article about tea ware, the author of that paper graciously invited me to see her exhibit of 1643–1790 Chinese export porcelain,* which resulted in my driving from Ann Arbor to Indianapolis—encountering the above teacups en route—and learning a great deal about early tea and coffee ware from scholar Shirley M. Mueller. Europe: In Need of Teapots . 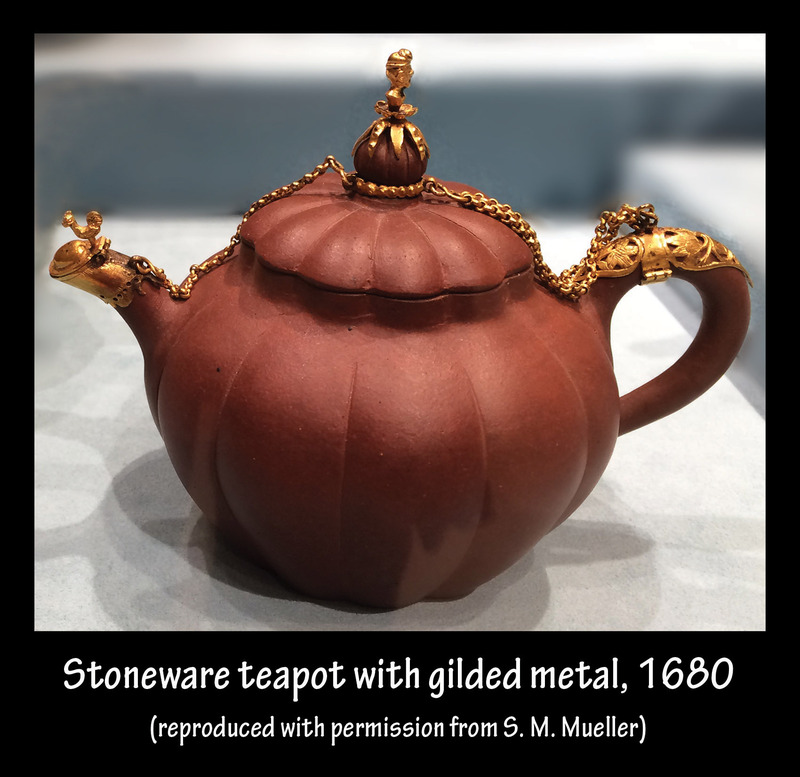 . .
As we examined her collection at the Indianapolis Museum of Art, Mueller explained that although the Dutch East India Trading Company was ordering teapots from China by 1626, it wasn’t nearly as straightforward as we might think. Initially, the Chinese weren’t quite sure how to make teapots for the European market. In fact, throughout the 1600s, they struggled to figure out what the Europeans wanted and needed. Feedback, after all, was a laborious process. Mueller pointed out that it took a year for a European ship to reach China; it typically spent a year there, and then took another year to return to Europe—a three-year turnaround! At the time, the Chinese generally brewed their tea in Yixing stoneware. These unglazed pots were porous, which meant that when hot water was poured into the pot, up to 4% of it was absorbed by the pot itself, Mueller explained. Interestingly, this attribute was to have real repercussions for the export industry. Further, although these stoneware teapots did make it to Europe and were even embellished, as in this example, this wasn’t really what the Europeans wanted! The Portuguese named this ware porcelain, evidently due to the “resemblance of the finish to a lovely, colorful, glossy tropical marine shell found in the Mediterranean area.”† It was also called China-ware, meaning literally “ware from China,” later shortened to china. It also came to be called hard paste porcelain or true porcelain. Because Europe had not yet identified a source for petuntse and kaolin, they could not produce porcelain. So What Did Europe Want in a Teapot? Coming in my next post—and I guarantee that you won’t have to wait three years! †Malone, Laurence A., How to Mend Your Treasured Porcelain, China, Glass, and Pottery, p. 104. Reston, VA: Reston Publishing, 1976.